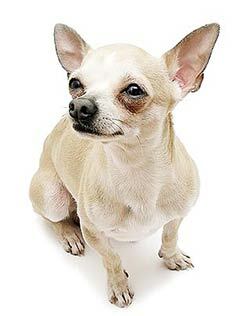 The Chihuahua is divided into two breed types, one with a soft short coat and the other with a soft long coat. Although reserved to strangers and unknown pets, Chihuahuas are very loyal and devoted to their owners. The Chihuahua dog breed is known for its saucy expression and alert attitude. Despite their small size, Chihuahuas make good watch dogs. The Chihuahua originated in Mexico. Chihuahuas range from six inches to nine inches. Chihuahuas range from two to six pounds. Coloring in the breed is all over the map. Chihuahuas are acceptable in any color; however, some experts have concluded that the genes associated with merle or dapple are also associated with blindness. Dapple coloring is when light-colored spots are present on a background of a darker shade of the same color. In some countries, merle dogs may not be shown, as breeders try to remove this gene from the breeding pool. In the United States, acceptable colors range from solid black to solid white, with any patterning. However, the classic color is fawn, the same as the dog from the commercials. Chihuahuas have either short or long coats. The short coat is soft to touch and only requires minimal grooming. The long coat is soft and can either be straight, wavy or curly. The long coat needs occasional brushing to keep it from matting. The Chihuahua is an excellent companion and a highly devoted breed. Reserved when it comes to strangers, the Chihuahua makes a good watch dog. The Chihuahua is known as a stay-at-home dog and gets along well with other household pets. The Chihuahua is susceptible to patella luxation and eye problems. The expected life span of the Chihuahua is 15 or more years. Chihuahuas are adequate for apartment living, though they tend to be noisy. Chihuahuas need little exercise to remain happy and a couple of trips outside each day will provide ample exercise for this playful breed. The Chihuahua is in the toy group. How could you not love the Taco Bell dog? In addition to the dog in commercials, you may have seen the Chihuahua in the Legally Blonde movies and in Batman Returns. The breed has also been featured on TV in That's So Raven, Courage the Cowardly Dog, Krypto The Superdog, Ren & Stimpy, and The Simpsons. Even Cesar Millan has featured his own Chihuahua, Coco, on his Dog Whisperer series. Chihuahuas are tiny with big personalities! The Chihuahua was discovered in Mexico, in the state of Chihuahua, of course! Originating from at least the 9th century, the Chihuahua is the oldest of the breeds originating in the Western Hemisphere. The breed likely developed as a mix between the Techichi dog favored by the predecessors of the ancient Aztecs, and the miniature Chinese dogs brought to Mexico by the Spanish Conquistadors in the 15th and 16th centuries. It is said that Christopher Columbus carried the new breed to the European continent on one of his sailings back to Spain from the new world. These dogs are extremely small - the smallest breed in the world. The breed standard says they shouldn't weigh more than 6 pounds, and in the British breed standard it even states that if two dogs are relatively equal in a show, the smaller one should be given preference. In the pet world, as opposed to the show world, Chihuahuas often grow as big as 12 pounds. They stand just 6 - 9 inches tall. Most other dogs would probably consider them an hors d'ouevre. Some people may describe a Chihuahua as teacup, pocket-sized, tiny toy, miniature, or standard, attempting to convey that a particular dog is worth a higher price or better in some way. The Chihuahua Club of America points out that there is only one breed standard, and any individual dog may weigh anywhere from 2 to 12 pounds. 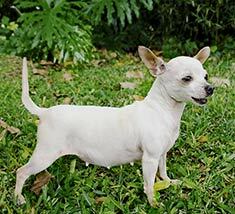 Adding a modifier in front of the breed name is not correct, as there is no such thing as a miniature or teacup Chihuahua, and smaller dogs of the breed are not any different or more valuable than the larger examples. 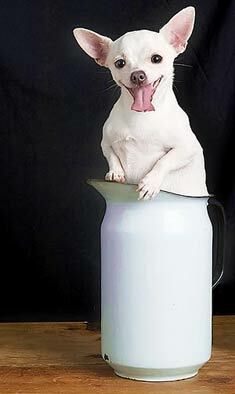 "Teacup" Chihuahua is a misleading term as there is only one breed standard. The Chihuahua comes in two coat types: short hair and long. Paradoxically, the long-haired type actually sheds less than the short-haired type. The short haired dog is sometimes called smooth-coated, although this, too, is misleading, as the fur may have a whiskery feel to it. The long coated type generally looks fluffy due to a downy undercoat which also makes them feel very soft. Coloring in the breed is all over the map. Chihuahuas are acceptable in any color except merle (also known as dapple) because this color is associated with health risks such as deafness and blindness. Dapple coloring is when light-colored spots are present on a background of a darker shade of the same color. Merle dogs may not be shown in most countries, as breeders try to remove this gene from the breeding pool. Acceptable colors range from solid black to solid white, with any patterning except dapple. However, the classic color is fawn, the same as the dog from the commercials. In spite of their small size, Chihuahuas can be ferocious. You must take care when the dog is around larger dogs as he is easily injured. Some Chihuahuas prefer the company of other Chihuahuas rather than different breeds of dogs, but when they do play with other, larger dogs, they don't understand that they are the underdog due to their size. These dogs are very loyal, sometimes to only one member of the family. Jealousy of human relationships is not unheard of when a Chihuahua decides that you belong to him, but proper socialization can help the dog learn to accept other humans. The breed is known for being needy. They want all of your attention, all of the time. Chihuahuas are not recommended for homes with small children, as they have a tendency to bite when frightened. The dog's temperament is often high-strung, making him not appreciate the noise and commotion associated with toddlers and pre-schoolers. The biggest challenge to the health of a Chihuahua is overfeeding. With their small bodies, they really don't need a lot of food, and snacks are definitely out. These dogs are known for being picky eaters, so care must be taken to make them eat the right foods. Overfeeding of dog food and table scraps can lead to joint problems, diabetes, tracheal collapse, chronic bronchitis, and a shorter life. 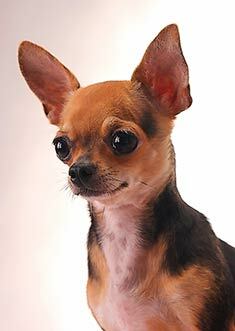 An interesting difference between Chihuahuas and all other dog breeds is that Chis are born with a soft spot in their skulls, called a molera. The soft spot hardens over the first six months of life as the skull knits itself closed. This is similar to a human baby's soft spot, and care must be taken to prevent injury to the dog's brain until the skull is fully closed. You must make sure your veterinarian has experience with baby Chihuahuas due to the soft spot and the possibility of hydrocephalus. The two are often mistaken for each other, which can have deadly consequences. Just as in other toy breeds, the Chihuahua is prone to swelling on the brain because the cerebrospinal fluid cannot drain properly from the skull. A dog with hydrocephalus will have many soft spots in the skull because the additional fluid in the cranial cavity keeps the skull plates from fusing. The puppy will have large eyes due to the fluid pressure, but Chihuahuas have large eyes anyway, so this may be hard to distinguish. A hydrocephalic puppy will have a larger head than his littermates, will be lethargic, and will grow more slowly. A dog with hydrocephalus can be expected to live a very short life, vs. the average lifespan of 15 - 22 years for a normal dog. 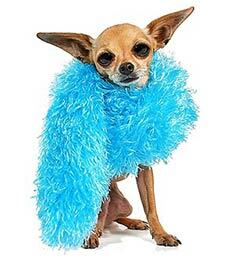 Your Chihuahua may appear to be cold most of the time. They burrow under blankets and pillows, and have been known to lie in the sun for longer than they probably should. You must protect them from getting overheated by making them move to a cooler spot when they begin to pant excessively. Another interesting feature of the breed is that they shiver a lot, even when they are warm. This is likely due to their high metabolic rate, rather than any temperature-related discomfort. Due to their tiny size, Chihuahuas like to keep warm. When you take your Chihuahua outdoors, there are some special considerations. First, remember that he is very close to the ground, so look out for hazards that stick up, such as rakes, nails, or stakes in the ground. Second, because he is so small, animals of prey, particularly birds, may think he's a tasty snack. The Chihuahua may challenge larger dogs, and will almost surely lose the fight. Your Chihuahua should be kept away from small children to lessen the chance he will bite them. Overall, the Chihuahua can be a wonderful companion for you, particularly if you live in a small apartment where larger dogs can cause a problem. However, make sure you are ready to give him the proper attention he craves and that you are prepared to make a long commitment to this long-lived friend. Find Chihuahua Puppies with our Free Breeder search!